LISTedTech has released a new data set of the higher education SIS market showing announced SIS implementations since 2011. The data set confirms what many in the industry have been sensing, that institutions of all sizes have been holding off on decisions to implement new SIS products. 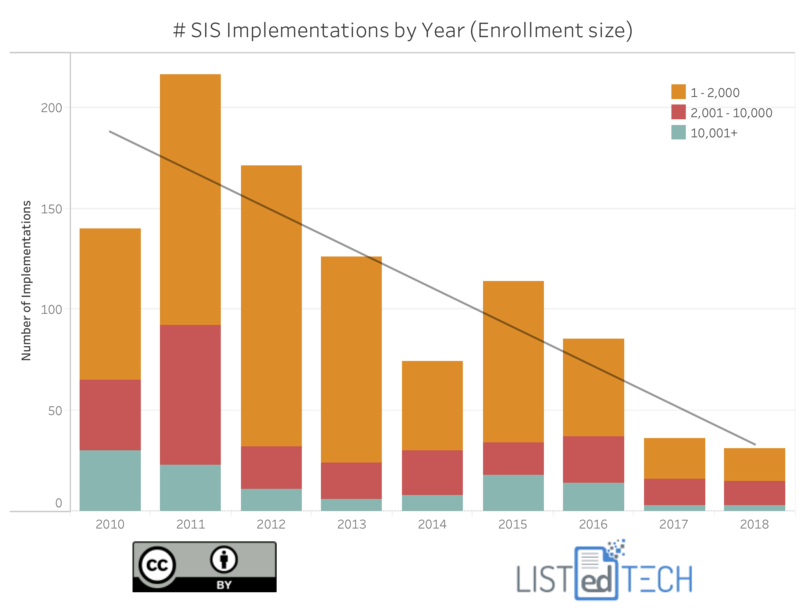 The data shows a steep and steady drop off from a high of nearly 120 announced implementations in 2015 down to fewer than 40 announced SIS implementations in 2018. Note that the overwhelming majority of announced SIS implementations are in institutions of fewer than 10,000 students. While outside observers could view these data as a sign of a market in steep decline, we believe this is merely a market taking a pause. We continue to have many institutions asking for our advice on SIS and ERP decisions. The market seems to be holding off on major SIS commitments, until new products and major revisions of existing products become viable. The willingness to take risks with new software products varies across institutions: some like to be pioneers and be the first to install new products; others want to wait for the products to be installed and stable before moving to new products. This also impacts the rate of new implementations. At the same time, we are hearing more and more from institutions that they need systems that help them address their critical needs of greater efficiency, mobility and self-service, assistance with improving student outcomes, stronger analytics to address strategic decision making, etc. Schools want SIS systems that are outcomes focused and not just data transaction/storage applications. Vendors in the Higher Education SIS market are feverishly racing to come out with new cloud-based products. Some products are rewrites of existing products based on cloud architectures, other vendors are completely overhauling their offerings, and yet there are newer market entrants making their mark as well. Some of the products are integrating traditional CRM capabilities and others are building stronger integrations with CRM applications to assist in addressing the student success enhancements institutions are seeking. Watch this blog for future entries as we explore the emergence of cloud-based SIS and other ERP products for higher education. We will be exploring a range of topics that affect institutional decision making. We’ll spotlight individual vendors on their unique approach to technology change. And we’ll watch for market changes sure to emerge in the coming years as new products hit the street and early adopters start announcing implementations in 2019 and 2020. Moran Technology Consulting helps institutions cost-effectively address their technology-related challenges, providing: Strategic IT planning, Assessments and Governance development, ERP/SIS planning, support and audits, Cloud migration planning, IT Security Assessments, Enterprise Authentication Solutions, Process Reengineering, and interim IT and Project management services. LISTedTECH is a market research company that provides analytics for technology systems used in the educational sectors. Our unique data sets include technological systems like Alert, BI, CRM, Email, ERP, Grant, LMS, OPM, Retention and SIS.